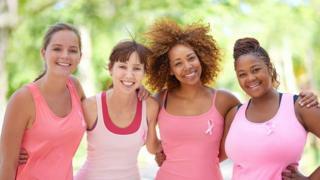 Image caption Breast cancer is not one disease but 11, say researchers. However, the way the scientists analysed and sorted the cancers is still too complicated to be introduced to the NHS. It will need refining into a form that could be used as a routine way of analysing a woman's cancer. Much larger studies involving up to 12,000 women are also planned, so that researchers can be certain of their results. Prof Caldas said: "I would not recommend it clinically yet, but we really are committed to making this available. "We are totally committed to having an NHS test, we haven't patented any of this." Prof Karen Vousden, Cancer Research UK's chief scientist, said: "We're still a way off being able to offer this type of detailed molecular testing to all women and we need more research to understand how we can tailor treatments to a patient's individual tumour biology. "But this is incredibly encouraging progress."